Up until I recently, I didn’t realize how life changing avocado is. Avocado is super healthy for you and can be used for just about any meal. By far though, my favorite use for avocado is guacamole. This is the best recipe for guacamole that I’ve found. While it doesn’t taste exactly like Chipotle’s guac, it’s still super scrumptious. 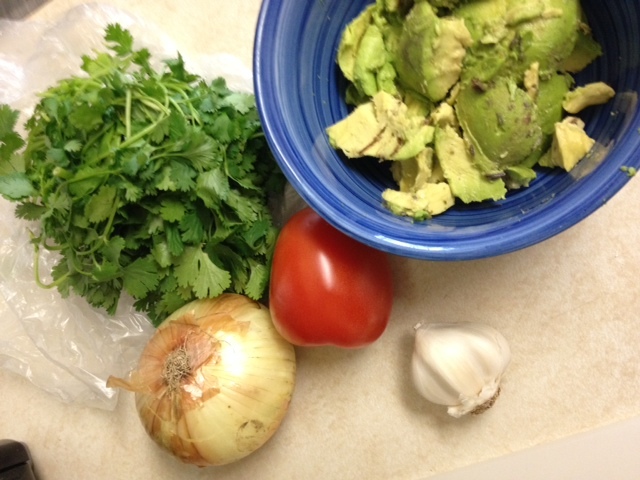 This recipe calls for avocados, lime, salt, onion, cilantro, tomatoes, garlic and cayenne pepper. I don’t use cayenne pepper since the garlic gives the guacamole enough of a kick. The first time I made this guacamole, it took me about an hour to make just because I had to look up every single thing. Like what’s diced onion? How does dicing differ from mincing? I don’t know how people cooked before the internet. What’s diced onion? WikiHow explains it here. Basically you just peel the skin off the onion, cut the onion ends off, cut it in half, cut the onion in strips with the flat end facing downward, and then cut the other direction. What’s minced garlic? WikiHow explains it here. Just cut off the hard end of the garlic, peel off the skin, cut in strips lengthwise, then cut the other direction. To make it super thin, run the knife across the garlic again. While I ate a majority of the guacamole before I remembered to take a picture, here’s a picture of the avocados partly mashed. I absolutely love this picture because everything looks so fresh! Fresh guac is probably one of my most favorite things in the world. Hope you enjoy!